You can also buy the custom case by itself for $100. Boutique builder Maingear has overhauled its Vybe desktop line with new hardware and configuration options, but there is more going on here than just a simple refresh. Maingear is being a bit more ambitious, and pitching this as a "Vybe Enthusiast Platform," not just a pre-built desktop line. 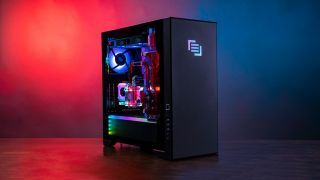 That's partially because the Vybe is not solely available as a pre-built PC—Maingear is selling the custom case by itself, both directly and through Microcenter. The boutique builder is having some website issues at the moment and so the option is not available at the time of writing, but Maingear has assured me that it will be available shortly. In the meantime, Microcenter has it listed on sale for $99.99, down from $119.99. The standalone case option is for folks who want to go the DIY route. It's a mid-tower chassis made of steel with RGB lighting and the usual cable routing options. Front I/O ports adorn the left-hand side and consist of two USB 3.0 ports, an audio input, and an audio output. It's a nice looking enclosure that mostly keeps it simple, with Maingear's logo tastefully placed on the front (which lights up). More traditionally (from a boutique builder standpoint), Maingear is of course allowing users to hop onto their website and configure a custom build. That option is busted at the moment as well, but should be available shortly. When it goes live, users will be able to select the hardware makeup of their PC, as well as add hardline water cooling and a custom paint job, if desire and budget permit. So, what is available right now? In addition to selling the Vybe's custom chassis by itself or allowing users to configure a custom build, Maingear has added pre-configured options that are ready to ship in less than 2 business days. There are four pre-configured to choose from, starting at $699 (Stage 1) for gamers who want a PC for esports, and going up to $2,499 for the most expensive model (Stage 4), aimed at 4K gaming and creators. The Stage 1 build doesn't come with a discrete graphics card, and instead relies on the Vega graphics that are part of the included Ryzen 5 2400G processor. The Stage 2 configuration costs $1,049 and adds a GeForce 1660 Ti GPU to the mix, and also bumps the power supply to a 500W model. Otherwise, everything else is the same. Maingear says it's appropriate for 1080p gaming. That's around $2,100 worth of hardware, based on a quick Newegg search for the same or similar components. So, you're paying a roughly $400 premium to have Maingear professionally assemble the components. That's obviously a sizeable chunk of change, though to Maingear's credit, the company does an excellent job with assembling clean builds and cable management in general. Whether that's worth several hundred dollars is, of course, subjective. If any of this interests you, head over to the Vybe landing page to check out the configs. Also, be sure to browse our selection of the best gaming PCs.